• The Daily Mail: One step, two step...? This is how the Daily Mail chose to portray asylum seekers this month. In the first cartoon, by the Mail's resident cartoonist, 'Mac' (Stanley McMurtry), a British couple are advised to tell asylum-seekers in a bed to ‘shove over’ to make room for them in a hotel temporarily accommodating people seeking asylum in the UK. In their related report, the Daily Mail complained that 100 asylum seekers had been temporarily given hotel accommodation and food at 'taxpayers' expense'. The second cartoon showed singer and TV star Cilla Black - just days after she died - queuing to enter heaven along with what the Mail called, 'thousands of illegals'. Over two-thousand desperate people, including children, drowned this year trying to reach the 'safety' of Europe by crossing the Mediterranean. Most of them were fleeing war, terror and oppression in countries such as Syria, Eritrea and Afghanistan. According to Genocide Watch, there are 8 Steps to Genocide. Is the Daily Mail stepping us closer with their daily deluge of hate towards foreigners and migrants generally, and asylum seekers in particular? 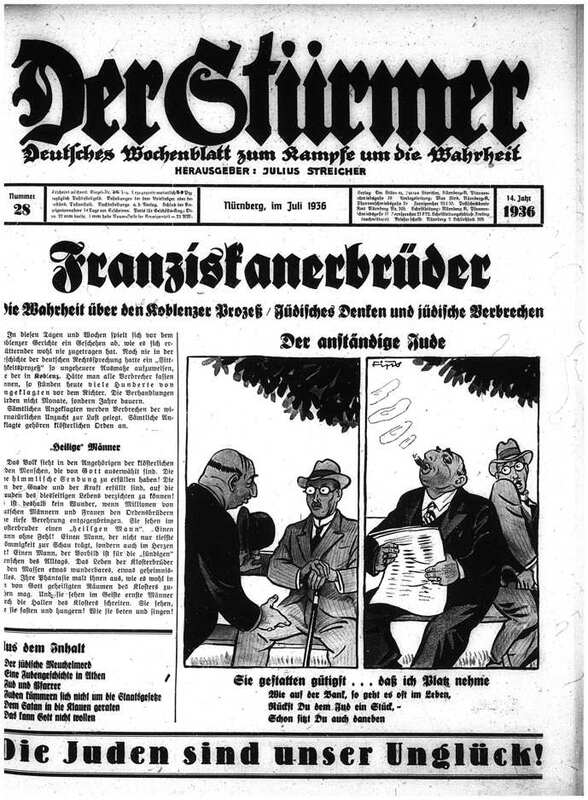 In the lead-up to the Nazi rule of Germany in 1933, and until its defeat in 1945, the Der Stürmer newspaper regularly published anti-Jewish cartoons which Hitler praised for influencing, "the man in the street". In the cartoons, Jews were regularly set-apart from 'normal' citizens (step 1 of the 8 steps) and portrayed as sub-human and a focus for hatred for 'causing' Germany's economic decline (step 2). • In this anti-Semitic cartoon in Der Stürmer from 1936 entitled 'The decent Jew', a Jewish man is shown politely asking for room on a bench, after which he shoves-off the previous occupant. The caption asserts that Jews behave the same way in other situations. Against this backdrop of decades of dehumanising Jews and other 'classes' of people (step 3), the Nazi regime went on to systematically exterminate millions of Jews, Roma, homosexuals and disabled people (step 7 of the 8 steps). After the war many of the Nazi perpetrators denied that they had committed any crimes (step 8). 1. CLASSIFICATION: People are divided into "us and them". 2. SYMBOLISATION: "When combined with hatred, symbols may be forced upon unwilling members of pariah groups..."
3. 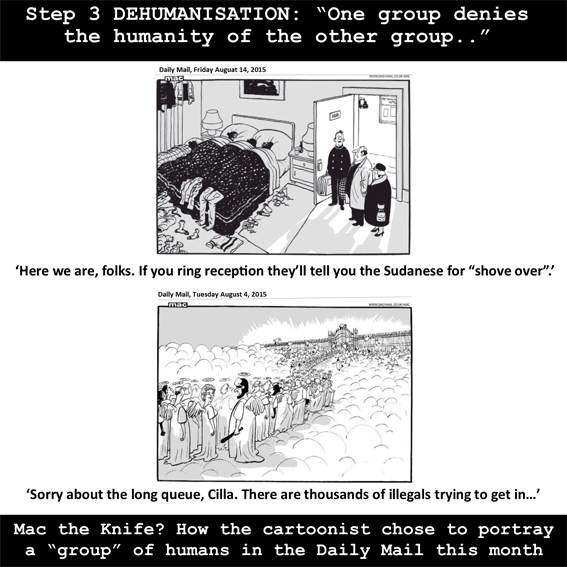 DEHUMANISATION: "One group denies the humanity of the other group. Members of it are equated with animals, vermin, insects, or diseases." 4. ORGANISATION: "Genocide is always organized... Special army units or militias are often trained and armed..."
5. POLARISATION: "Hate groups broadcast polarizing propaganda..."
6. PREPARATION: "Victims are identified and separated out because of their ethnic or religious identity..."
7. EXTERMINATION: "It is 'extermination' to the killers because they do not believe their victims to be fully human"
8. DENIAL: "The perpetrators... deny that they committed any crimes..."
In Britain today, as in Germany of the 1930s, cartoons are being used to promote fear, hatred and xenophobia. We know what happened in Germany when people turned against people – when one group of humans started to view another group as unworthy, verminous and sub-human. We need to speak up now against Britain becoming a society that’s fundamentally xenophobic.